Horse Care and Management | Chronicles of a "Mini-Pro"
I first read an excerpt of Jochen Schleese’s book, Suffering in Silence: the Saddle-Fit Link to Physical and Psychological Trauma in Horses, in an old issue of Dressage Today magazine. The segment provided there included information regarding the natural asymmetry of the horse, detailing how this condition develops, and how this asymmetry impacts saddle fit. I was struck by the technical precision in the writing and the clear passion which Schleese had for the subject. I immediately ordered a copy of the book to review in more depth. Schleese is a Certified Master Saddler and Saddle Ergonomist, and Schleese Saddles are known as being “ergonomically correct” for female riders. In this book, Schleese goes into a great deal of detailed explanation regarding the how’s and why’s of his theory of saddle fitting. In particular, he highlights the personal research he has done into the differences between male and female pelvic anatomy, and how this can impact each gender’s relative position in the saddle. What was even more interesting to me, though, were his thoughts on the ideal fit of the saddle to the horse. I have struggled to find the ideal saddle fit for two of my own horses; one is a distance horse who has completed two 100 mile competitive trail rides, and the other is a Connemara cross who does mostly dressage (each has their own tack). In the past, I have had certified saddle fitters adding pads, shims and all manner of other manipulations to make saddles fit. After experiencing years of frustration, I began working with someone new, who identified some basic issues, such as an inappropriate tree width, as being part of my problem. Still, the process of finding a correctly fitting saddle can make someone feel like the princess and the pea. Schleese emphasizes that a well fitting saddle for the horse must be a priority, as this variable, more than many others, can influence a horse’s long term soundness. In this book, he describes the horse’s saddle support area, with detailed discussion of the muscles, ligaments and tendons involved. Schleese uses clear descriptions as well as outstanding illustrations and diagrams to help the reader to see and understand where the saddle should be placed, the interaction of the saddle, girth and the biomechanics of the horse, and the importance of clearing the equine scapula. I can’t say enough about the quality of this discussion, and I think it is something which every horseman should read and absorb. I simply haven’t seen it done better, anywhere. Schleese draws areas important for saddle fit consideration on this horse; this image is used both in their text and on Saddlefit 4 Life’s website. Unable to find an official credit but go to Saddlefit 4 Life for more! I have since learned that Schleese is somewhat of a controversial figure in the saddle fitting/making community. There are some who feel that his “saddles for women” theme is just a gimmick to sell saddles; one saddler I spoke with said that if you want to sell saddles in the modern market, they “all better fit women”. Schleese also is a proponent of rear-facing gullet plates, a design which is counter to the principles espoused by the Society of Master Saddlers, a large certifying organization based in the U.K. However, there are many other saddlers who consider Schleese’s work to be inspirational; one local saddler says that his work is in fact what inspired her to become a certified saddle fitter. My mare Lee demonstrates how poorly her old saddle really fit her…and she did a 100 mile ride in this! With all that being said, I don’t consider this book to be a sales pitch, but rather the outcome of one man’s passion for promoting greater awareness of the critical importance of saddle fit for horse and rider. The text is clear and accessible to any conscientious horseman, the book is incredibly well illustrated through diagram and photograph, and many additional resources are provided where readers can learn more. I was so inspired by reading this book that I have actually reached out to Schleese’s company, Saddlefit 4 Life, and we will be hosting a seminar with him at the University of New Hampshire Equine Program on September 20, 2017. Visit www.equine.unh.edu fore more information. For horses covering long distances, the management of metabolic health is of the highest priority. For the competitive distance rider, attention paid to these specific parameters can spell the difference between a completion and a pull (or retirement, for riders used to other disciplines). Distance riding is a sport whose mantra is the phrase, “to finish is to win”. Most distance riders want to have a fun and successful weekend, which means that they are bringing home a healthy horse; to this end, they are always working to learn how to better care for their mounts. Dr. Susan Garlinghouse presented “Beating the Metabolic Pull” at the Eastern Competitive Trail Ride Association (ECTRA) Winter Getaway in Boxborough, MA in early February, offering attendees instruction and strategies based on the most current of scientific evidence. Dr. Garlinghouse is an endurance rider and has completed the grueling Tevis Cup no less than three times. She has ridden her Tennessee Walking Horse John Henry over 2,800 endurance miles. Garlinghouse referenced John Henry many times during her talks throughout the weekend, as her insights into metabolic management have been influenced by the additional challenge posed by preparing a horse with a dense build for strenuous competition. She is a well-known authority on many of the unique health and maintenance issues faced by the distance horse. Garlinghouse emphasized that during a ride there are three primary factors which must be managed to ensure the horse’s wellbeing: hydration, gut motility and energy balance. They are listed here in their relative order of importance, and we will explore each one now in a little more detail. Garlinghouse says that 90% of metabolic issues come from hydration loss. The line between “sufficient hydration” and a horse at risk is incredibly narrow. Horses sweat at the rate of 1.5-3.75 gallons per hour, and may produce over forty gallons of sweat during a 50 mile ride. During heavy exercise, horses may lose 5-6% of their body weight, with about 4-5 gallons of net fluid loss. Dehydration during heavy work can affect equine athletes in all disciplines, and the effects come on quickly, beginning with 2-3% dehydration rates. Health concerns escalate rapidly from there. At 6% dehydration, capillary refill time and heart rate are elevated. At 8%, capillary refill time will be 2-3 seconds (normal is under 1), with dry mucous membranes, dry or mucous covered feces, and decreased urine output. At 10% dehydration, capillary refill time will be over three seconds, and the horse will have a high, hanging heart rate with weakness and cold extremities; this horse is in serious trouble. At 12%, the horse is close to death. The difference between 4 to 8% hydration in a 1000 pound horse is only 4-5 gallons of water. Some riders believe that the horse will naturally consume water sufficient to replace this lost fluid, but this is a myth. According to research done on fluid balance in endurance horses conducted at UC Davis, the horse will only replace about 2/3 of fluid loss through voluntary drinking. For example, if ten gallons of fluid have been lost, the horse will only voluntarily consume 6-7 gallons. Equally concerning is that this same research showed that over 60% of the horses starting at the 100 mile endurance rides where the studies were being conducted were already dehydrated to some extent, prior to starting the ride. Another 20% were at the high end of normal. Just 10% of the starters began the ride at optimal hydration. Therefore, it becomes incumbent to create situations in which the horse will stay at a higher rate of hydration before and during the ride. Garlinghouse offered several strategies to help with this. Even for the non-distance rider, some of these practices could help enhance their performance horse’s well-being, especially before intense work or competition. First, Garlinghouse recommends feeding lots and lots of hay—horses will drink 1.5-2 gallons of water for every five pounds of hay that they consume. She also reminded the audience that the rate of passage from the mouth to the hind gut is relatively slow. What you feed your horse on Thursday becomes their source of energy on Saturday. Roughage should always be at least 50% of your horse’s ration, and for a distance horse, more is better. Feeding soluble fibers, like beet pulp or soybean hulls, can also increase the fluid reservoir available to the horse during a ride. These feed stuffs help to retain fluid and electrolytes which the horse can pull from during exertion. The manner in which we feed our horses is also important to consider. Garlinghouse explained that there are fluid shifts in the body associated with the consumption of large (over 4.5 pounds), episodic (fed more than 2-3 hours apart) meals. When we feed on this schedule, as much as 5-6 gallons of fluid shifts from the plasma and tissues and into the gastrointestinal tract, leading to a 15-24% reduction in plasma volume. The effect is transient, lasting two to three hours. If your horse is at rest, this isn’t a big deal. But if your horse is teetering on the edge of being dehydrated, and then there is this huge fluid shift…well, that is not good. To prevent this, riders must ensure that their horse has something going into their digestive system more frequently than every two hours. Garlinghouse emphasized that the quantity doesn’t have to be great—grazing, some carrots or apples, a baggie of soaked beet pulp—will all do just fine. On a related note, Garlinghouse cautioned riders about the common practice of syringing large doses of electrolytes into the horse’s mouth, as this draws fluids from the plasma and into the digestive tract in a similar way to large servings of food. The effect can be minimized or eliminated by giving electrolytes in small but frequent doses, preferably after the horse has been drinking. So eight, 2 ounce doses is preferable to two, 8 ounce doses. Garlinghouse also recommends mixing electrolytes with a buffer like kaolin pectin to help reduce the risk of ulcers. Another cause of excess dehydration is feeding high amounts of protein. Garlinghouse recommends feeding distance horses at a 10% protein rate. Protein fed at higher rates will be used for energy production, but processing protein in this manner results in waste heat, almost 3-6 times as much as what is produced through the processing of fats or carbohydrates. While dehydration is responsible for 90% of metabolic problems, gut motility can be one of the first accurate indicators of stress. Gut motility slows down when blood supply is reduced, which can happen anytime the horse’s systems are under excessive demand somewhere else. This is because the gastrointestinal system is the last in line in terms of the “pecking order” amongst the horse’s body systems; vital organs like the brain, heart and lungs come first, followed by the muscles of locomotion, then skin surfaces for heat dissipation…and then the GI tract. This chain of command stems from the horse’s prey animal status; if you are about to be eaten, it is more important that you can effectively run away than that you can digest your breakfast. For the well-being of the horse, it is important to actively monitor and stimulate GI activity during a ride. Garlinghouse recommends carrying a high quality stethoscope and have a vet teach the rider how to check all four quadrants. Improving motility can be as simple as keeping small amounts of feed in the stomach, which triggers a hormonal release thereby increasing motility. Another strategy is to occasionally slow down, which will reduce heat production and therefore the demand on the skin surfaces to release excess heat. The nature of distance riding can cause a horse’s body to think is constantly being chased. Slowing down will reverse this effect. Garlinghouse cautions against feeding pellets or cubes at a ride, both of which require extra fluids to process. Instead, feed soaked products, including hay. The better the horse’s overall hydration, the more efficiently he will circulate his blood and therefore improve his gut motility. A distant third to hydration and gut motility in terms of managing the horse’s metabolism during a ride is energy balance. There are many different strategies related to effectively managing a horse’s feed ration leading up to and during a ride. Garlinghouse helped to dispel some common misconceptions and offered some practical tips to help ensure adequate energy reserves for the endurance horse. There are two primary sources of energy for exercise: fats and glucose (from carbohydrates). Fats are more energy dense, offering 2.25 times the energy of an equivalent amount of carbohydrate, and the body can store fats in much greater quantities. Glucose is generated from the breakdown of carbs; limited amounts are stored as glycogen in the muscle and liver, but glucose is the limiting substrate in fatigue. Therefore, the thoughtful rider should be trying to maintain glycogen stores by balancing the diet with fat. Garlinghouse suggests a ration with 10-12% fat in a commercial grain is acceptable, so long as horses are given time to get used to it. Fats are calorically dense and help to maintain the horse’s body weight. They also have a glycogen sparing effect. Additionally, Garlinghouse recommends supplementing with a glucose source throughout the ride. Riders should not provide extra fats during a ride, as the horse cannot process fat that quickly. A horse in good body condition already has all the fat they need for the day’s energy requirements. Horses should not arrive at the ride so thin that ribs are visible, as they do not have an adequate fat reserve. 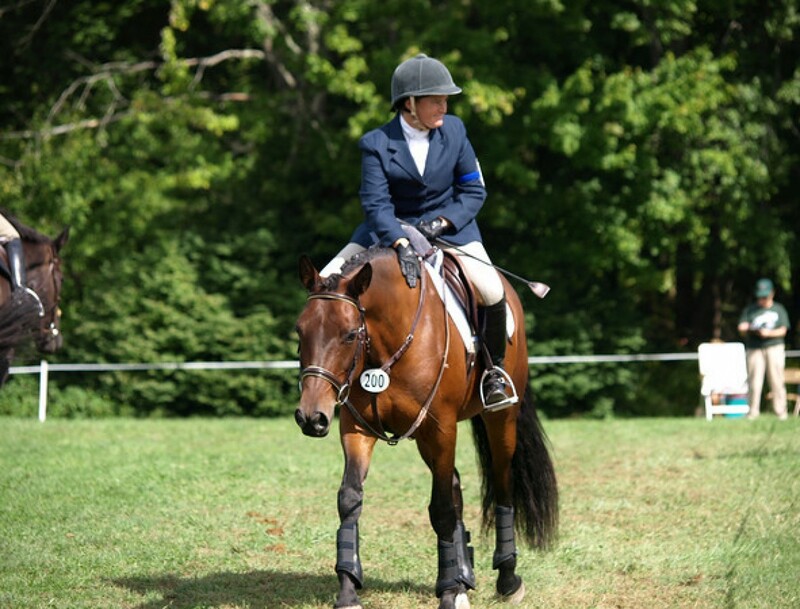 My distance horse, Lee, has been running on ProForce Fuel for the past three seasons. It is 12% protein/13% fat. One of Garlinghouse’s most important messages related to energy balance was that horses should not receive a large grain meal within four hours of their ride. Feeding grain causes an increase in blood pressure, triggers insulin release and inhibits the utilization of fat. In the distance athlete, this is particularly troublesome because the horse will experience something similar to a ‘sugar high’; the transient effects of the grain meal will cause the horse to be hyper to start the ride but then they will experience a ‘crash’. Most grain digestion occurs in the small intestine, and the stresses of the ride will cause some of the grain to spill into the cecum undigested. The bacteria which live in the cecum are not able to process grain, and this can cause GI stress. Garlinghouse again emphasized that horses should be fed a meal with a high glycogen index (like a sloppy beet pulp meal) not later than midnight before a ride. On the ride morning, horses should receive unlimited hay and then small, frequent meals throughout the ride day, which will minimize the insulin response while maintaining gut motility. There is certainly always more to learn when it comes to managing a horse’s well being during a long distance ride. Garlinghouse gave attendees plenty to think about and apply to their own horse’s feeding and management strategies as we move into the 2017 season. This past September marked my first full year here at the farm, and overall Mother Nature was kind to me in my rookie year (thank Gaia!). Each season brings its unique positives and challenges to horse keeping. I have worked on farms for decades but it is certainly a different experience when you are the one making the decisions and doing most of the work. Now that I have had a full year under my belt here, it is time to pause and reflect on what I have learned so far. Winter is here in New England. A few days ago, the farm was buried under 10” of heavy new snow, and now we have huge plow piles, tunnels to gates and waters and temporarily shorted out electrical fencing. Last winter was relatively mild, which was much appreciated as my learning curve with the new property was fairly steep. This winter already seems as though it will be more intense; we have had more snow, more ice and more crazy temperature swings before the end of December than I think we went through all season last year. Winter is certainly a challenging time for horse keeping. All tasks are made harder due to the cold, the snow, the frozen patches…if you have dealt with it, you know. If, after doing all the work to take care of your horses, you still have the energy to ride, it is still freezing most days, and I personally dislike having to wear layers and fat gloves and heavy boots. But here is the thing–in New England, our ecosystems NEED winter. The snow allows underground aquifers to recharge, deciduous trees, grasses and shrubs rest, and we all have a respite from most of the creepy crawlies that plague our horses the rest of the year. Days are short, temps are low and the footing is questionable, which means that serious training can really only occur if your horse is stabled at an indoor. One lesson I have learned from the distance riding community is that a little rest for your horse is almost never a bad thing. No athlete can maintain peak performance year round. Here in the snowy north, winter is the best time to allow your equine athlete the opportunity to rest and recharge. After all, nature is doing it, right? Winter can also be a time of astounding beauty. As much as I curse the mounds of snow after a storm, there is something utterly peaceful about being outside with the clean landscape, tree boughs heavy with accumulation, and horses happily rolling, leaping and playing, whiskers and eyelashes frosted. It doesn’t seem to bother them anywhere near as much as it bothers me! With most riders spending less time in the saddle, winter is also a perfect time to thoughtfully make plans and set goals for the upcoming season. In spite of my efforts to maintain a positive outlook towards the season, winter nearly always outstays its welcome, as far as I am concerned. I eagerly look forward to any early signs of spring, especially as the days lengthen and winter’s piles lose their resiliency to the strength of a sun which rises ever higher in the sky. I love the smell of the damp earth as it emerges from beneath the snow’s protective blanket and the sun begins to awaken all of the sleeping entities lying beneath the topsoil. Seeds sprout, the grass becomes brighter and tree leaves begin to unfurl with reckless abandon. Getting legged up April 2016. Spring means that we can finally give the paddock a good cleaning, knock the cobwebs down from the corners of the barn, and begin to launder blankets and stow the shovels and scrapers. We trade snow suits for being covered with the shedding hair of our equine friends. Spring is the time to put all of the plans which we schemed during winter’s lull into action, the time to start to condition our mounts and prepare them for the upcoming active season. Marquesa and Lee enjoying spring grass in May 2016. Songbirds return. At Cold Moon Farm, there are multiple micro habitats and a lot of edge, and the color and activity of birds just returned from warmer southern climates brings a feeling of lightness and joy. The grass begins to stabilize and the horses can begin the slow, gradual process of acclimatizing to grazing. But spring is not all sunshine and buttercups. Winter clean up can be onerous, from replacing torn sod to fixing broken fencing to removing downed tree limbs. Dirt paddocks quickly turn into quagmires as snow melt runs off and April’s showers saturate (hopefully within the next few years we will have a proper, improved drainage in the sacrifice area). Perhaps most annoyingly, fly season officially gets underway in April with the appearance of hordes of blackflies. And worst of all, ticks are seemingly everywhere, emerging as early as possible. Yet just as you think you can’t take any more of the mud and the bugs and the need to clean up yet another area of the farm, the season changes again. The hazy days of early summer. June 2016. Summers in New England are short and intense. There are really only maybe eight to ten weeks of true, full on summer, and we try to make the most of it. I think I must be part cat, because I just revel in the sun and want to absorb as much of it as possible. I love to get up early and feel the cool, fresh air in the morning, and I can’t wait to get out and about for the day. My favorite thing is to ride first thing in the morning, before the humidity builds up, then sip on an iced coffee and teach for the afternoon. This past summer was super sunny, which I loved for my own purposes, but in reality, it was not the best thing for the ecosystems of the northeast. Between the light snow season and the lack of rain, New England soon found itself in a drought. I began to hear stories of wells running dry–I soon learned that these were mostly dug wells, which go down 9-12 feet, as opposed to a drilled well like mine, which is usually 200 feet or more and taps into an aquifer. But it was stressful to know that homes around mine were experiencing problems with their wells, so I worried about what I would do if water ran out at the farm. The drought also meant that the grass went dormant far earlier than usual. I had to pull the horses off their grass fields in August and switch to feeding hay, almost a month earlier than I had anticipated. On the plus side, I barely had to mow the lawn and I got away with not having a brushhog yet for the fields out back. But as the grass began to crisp and the streams and water crossings out back ran completely dry, it was clear that the unusual weather was taking its toll. Late summer can be a good time to spread lime on your fields, but that requires a heavy rain to help flush it into the soil. I got lucky in the timing of an application right before one of our only big storms in August. Just as I thought that the fields and the yards and the trees couldn’t possibly take another sun soaked day, deprived of water, the seasons changed again. Lime being spread August 2016. Fall here is simply stunning. There are many maples on the property, which flamboyantly flash red and orange as the overnight temps cool and days begin to more obviously shorten. Beech trees and a few oaks mix in as well, offering a later surge of color. Lower in height, shrubs like sumac and dogwood are also not to be missed. The trails out back offer a range of color displays, in every direction. The drier air feels like a relief and this year, the fall brought with it some blessed rain to help begin to reverse the effects of an overly dry summer. Late summer flowers bloom amidst the falling leaves, lending a competitive sense to the changing seasons. The view from between Anna’s ears. October 2016. These two things don’t seem to belong together (October 2016). Fall on a horse farm means it is time to prepare for winter. The first order of business was stocking the hay barn to the gills with as many bales as will fit (here, close to 300). Later in the season, it was time to put away the fixtures from the grass fields, which are closed for winter, then to trim the shrubs around the barn, put away the jumps and rails, and set up the heaters for the outside water. And of course, autumn is nicknamed “fall” because of the leaves. I have been lucky so far to either use the mower to mulch them or to allow strong winds to blow them off into the tree line; I certainly don’t relish the idea of hand raking the entire yard! Yes, I mowed over these, or at least the ones that didn’t blow away. October 2016. As fall winds down, winter begins again. And the cycle continues. Each year, the seasons come, the seasons stay, the seasons change. Each season brings its positives and its negatives, but without that yin/yang balance, it would not be as easy to appreciate the variety for what it is. New England is a dynamic place, and to successfully maintain a healthy place for ourselves and our horses, managers must consider the unique challenges faced during each change of the weather. Marquesa shows off her “frosticles”. Winter Solstice, 2016. So as I trudge outside yet again in my full Yeti suit, I will try to take the good with the challenging, and when it starts to get to the point where I think “I just can’t stand this (insert problem word here; examples could include mud, ticks, snow, ice, wind, torrential rain) anymore” instead I will try to say, “this too shall pass”. “You are so lucky to work outside,” they said. The Green Guide for Horse Owners and Riders is a super easy to read and well organized book which represents the most comprehensive summary of the concepts of “sustainable practice for horse care, stable management, land use and riding” in one place to have crossed my desk. Depending on your previous level of knowledge on the subject of eco-friendly horse management practices, this book might alternately be too basic in some areas or too detailed in others. In either case, though, you are likely to find references to supplemental sources which can direct you to more information. I have long maintained that the equine industry needs to get on board with more sustainable management strategies. Too many farms are overstocked, with destroyed paddocks/turnouts, unsightly and unsanitary manure piles and out of date protocols. This book helps take the reader through the steps necessary to establish a different paradigm, whether starting a farm from scratch or working with facilities and layouts already in place. Cook does an excellent job of balancing general guidelines with more specific detail. For example, each chapter concludes with guidance to be considered for various climate regions in the US and Canada. Manure compost bins do not have to be overly fancy. Image from http://www.horsesense-nc.com. Some of the strategies covered in this book include techniques for “harvesting” water from rainspouts for use as wash water or for irrigation (which, interestingly, is illegal in Colorado); several methods of composting manure; selection of sustainable and healthy building materials; reducing the use of fossil fuels, and reclamation of muddy paddocks. In addition, there is an extensive resource list compiled in an appendix which is clearly divided into sections such as green energy, grant sources, recycling, trail riding resources, helpful government and non-government organizations, etc. Management strategies which reduce mud will prevent your paddocks from looking like this one. This book really is a “must read” for anyone who is interested in being a good steward of their land, or in providing guidance to someone else who is in that role. The onus is on all of us as concerned and conscientious citizens to do a better job of implementing management practices which consider the local and regional environment. A healthy farm means healthy horses. Blogger’s Note: Cover image is taken from Sustainablestables.com, another great resources for assistance and tips on better horse and farm management strategies.